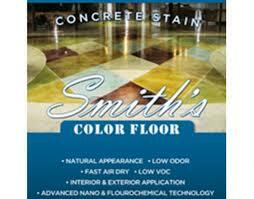 The scope is to feature an array of "Safe" products that can be used by both professionals and consumers to achieve beautiful floor finishes on old or new concrete. The system of using "Chemically Reative Acid Stains" recommened for professional use only is "OUT". 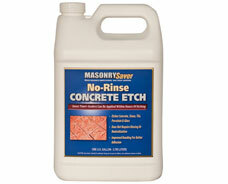 MasonrySaver No-Rinse Concrete Etch. 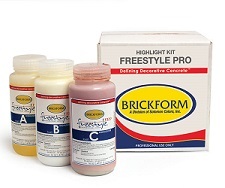 Designed to etch brick, masonry surfaces prior to staining and sealingCoverage: 200-400 sq ft per gallon on concrete. 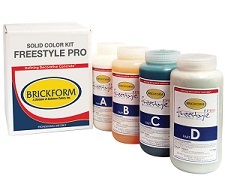 MasonrySaver Decorative Concrete Sealer -This product is designed to leave an attractive, non yellowing durable gloss finish that protects concrete from damage and color loss due to ultra-violet light, moisture and abrasion/wear. 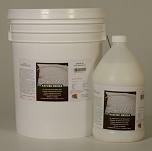 Coverage 100-200 sq ft per gallon on concrete. 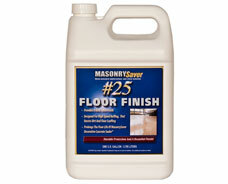 MasonrySaver #25 Floor Finish -Is highly durable water-based acrylic polymer interior floor finish. 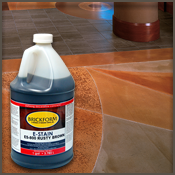 Coverage: 1,500-2,00 sq ft per gallon per coat. Minimum of two coats in non-traffic areas and six coats in traffic areas recommended.